Moise Kean, a 16-year-old, made his first-team debut for Juventus on Saturday, becoming the first player born in the 2000s to feature in Italy’s Serie A. The teenage striker came on as a substitute in the 84th minute for Mario Mandzukic against Pescara and he didn’t get to do much, but it was a remarkable milestone for the youngster nonetheless. 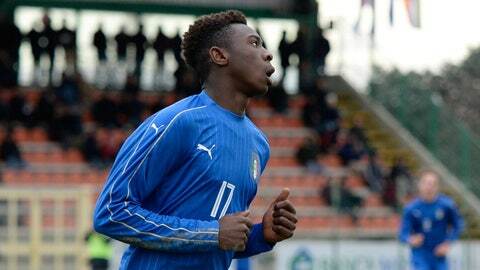 He has often been compared to Mario Balotelli after scoring 24 goals in 25 matches for Juve’s under-17 team last season. Kean did come into a match that was pretty firmly decided already – Juventus were up 3-0 by the time the teenager was substituted in – but he could be gradually building toward more playing time. If he features in the Champions League, he would become the Champions League’s fourth-youngest player and first player born in the 2000s. His debut for The Old Lady had been expected for weeks now, and for good reason: the kid can play. It’s pretty astounding to think about how young Kean is as he makes his debut in one of the top leagues in the world. Because it’s always fun to add a little perspective, the top single on the U.S. Billboard charts around Kean’s birthday was "What A Girl Wants" by Christina Aguilera and the top movie at American box offices was Scream 3. Yeah, that doesn’t feel all that long ago. Juventus may not have necessarily been known for developing young prospects as of late, but the 6-foot right-footed Kean looks like a promising new addition.